Well, it’s the first ‘proper’ week of my Easter break, so I decided to make my first trip to the Royal Academy of Arts for their highly anticipated Manet exhibition. As expected, there were queues of about an hour. I got in nonetheless, while trying to stay awake with a small Starbucks caramel macchiato – I called it Nemo. ‘Manet: Portraying Life’ is the first ever retrospective solely devoted to his portrait paintings, from family members to figures of authority, including the French Prime Minister George Clemenceau. Born into a wealthy family, Édouard Manet (1832-1883) was an artist deeply committed to the Realist movement, but he often took inspiration from the Impressionists and drew many themes from the Old Masters. His rather unconventional and sketchy paintings were rejected by the Paris Salon on numerous occasions, mostly deemed too unfinished, causing many of his paintings to have never been exhibited during his lifetime. His varying levels of finish also seemed to determine whether his paintings were for public or private use. For his more private pieces, the brushstrokes were usually more rapid with very little detail. The exhibition is split into 8 rooms or galleries, categorising his works into those of family members (Gallery 1), his cultural circle (4 and 5), models (7 and 8), and commissions by notable people referred to as his ‘status portraits’ (Gallery 6). 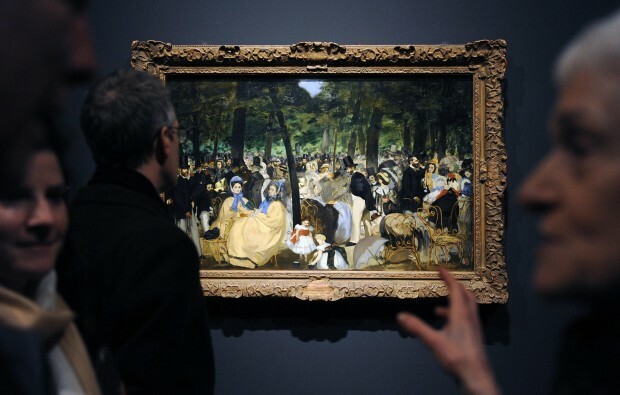 Manet had a primary focus: to depict the modern life of Paris. In many of his portraits we see the sitters dressed in the latest fashions, seen in Berthe Morisot with a Bouquet of Violets (1872). In The Amazon (c. 1882), a young woman is dressed as a professional horsewoman, considered a representative of a modern ‘type’ observed in 19th century Paris. Of his female sitters, the most frequent was his wife Suzanne Leenhoff, but another prominent sitter and model was Victorine Meurent, who is the focus of the last room in the exhibition. Meurent was the model for Manet’s highly controversial Olympia (1863), and Le déjeuner sur l’herbe (1862-63), both of which were unfortunately excluded from the exhibition – they currently hang at the Musée d’Orsay. We are, however, shown a later version of the latter from around 1863-68. Édouard Manet, The Railway, 1873. Image via www.yahoo.com. A particularly interesting part of the exhibition was the display of carte de visites in some of the rooms. Not only are we shown photographs of the artist – one of which was taken by David Wilkie Wynfield – and a number of his sitters such as Émile Zola and Antonin Proust, but we are also shown a digitised version of Manet’s own collection of carte de visites, preserved in a black fragile album. During his artistic career, the rise of photography was a major occurrence, presenting the general public with daguerreotypes and the reproducible carte de visites. I do, unfortunately, have two main criticisms about the exhibition regarding the layout. The first is with their choice to dedicate an entire room to a single painting, Music in the Tuileries Gardens (1862). It is obvious that the desired effect was to emphasise the importance of the painting, known for its encapsulation of modern life. However, the room they decided to place it in was way too big for that effect to happen. Compared to the room, the piece is tiny! The painting is just over a metre wide and it is hung on a wall that is about five times bigger. The resulting effect seemed more like they ran out of paintings to exhibit or better yet, too much space. I’ll admit that none of the rooms they had were small enough to create such an effect – after all, it was held in the Main Galleries, not the Sackler Wing, currently taken over by the George Bellows exhibition – but they didn’t even try to make the room smaller by placing additional walls, something that was evidently done to create Galleries 1 and 2 – otherwise it would simply be one very large room. In the end, the presentation seemed a bit tacky and it didn’t really do the painting much justice. 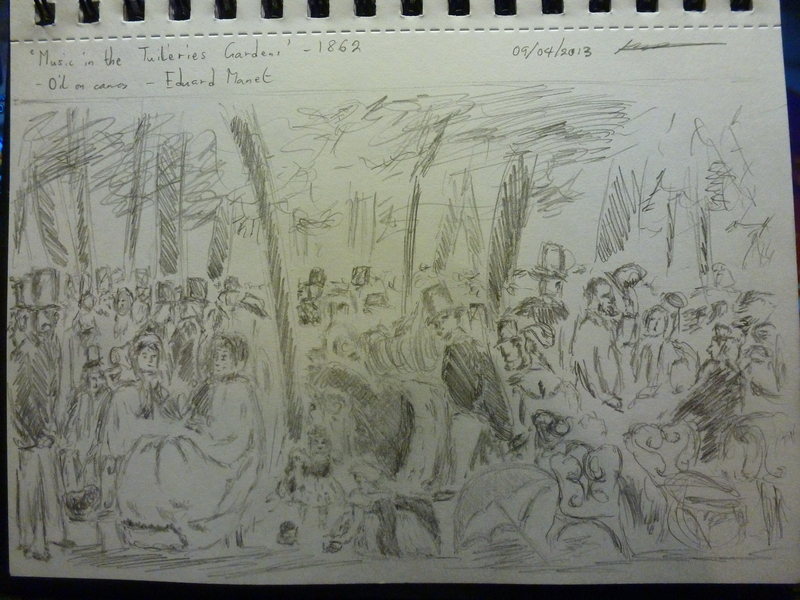 Édouard Manet, Music at the Tuileries Gardens, 1862. Image via www.repubblica.it. I couldn’t fit in Manet himself! Own photograph. The second point is to do with the next room, Gallery 3. As if out of nowhere, they decided to plonk a timeline of the artist’s life in the middle of the exhibition. This room also showed a large map of Paris, pinpointing Manet’s various activities. There were also seats and tables presented with what I assumed to be exhibition catalogues – I originally thought they decided to hold a mini-café in the middle of the exhibition, which would have been rather cool. This also happened to be the room where the digitised collection was shown. In all honesty, I rather liked the presentation of this room and its ‘exhibits’. They had a detailed timeline on one wall, and several large-scale maps on another. I also felt the furniture was appropriately placed to fill the large empty space in the middle. My problem, however, was the location. Just when we were getting into the paintings, they decided to give us a detour of Manet’s general and artistic career. It felt extremely out of place. Usually timelines are placed either at the beginning of an exhibition or at the end, serving as an introduction to the principal figures or a general rounding-up of the show. Based on this, I felt what the Royal Academy did was a very unconventional move, something I’ve never seen them do in my four years of seeing their exhibitions. Aside from these technical flaws, the exhibition was really good and I really recommend it. 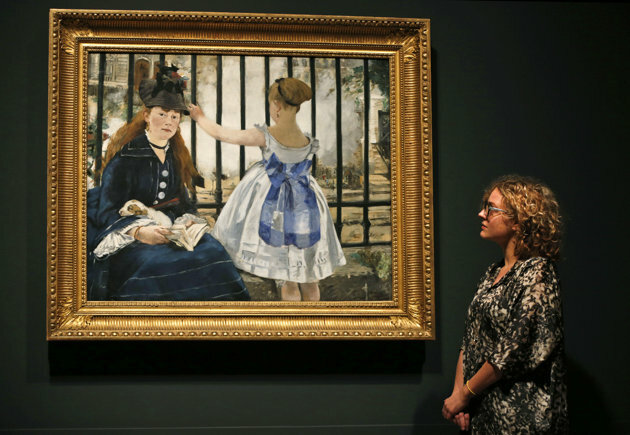 We see Manet as a painter dedicated to his own personal style, refusing to change it just so he could have his paintings exhibited through the Paris Salon. 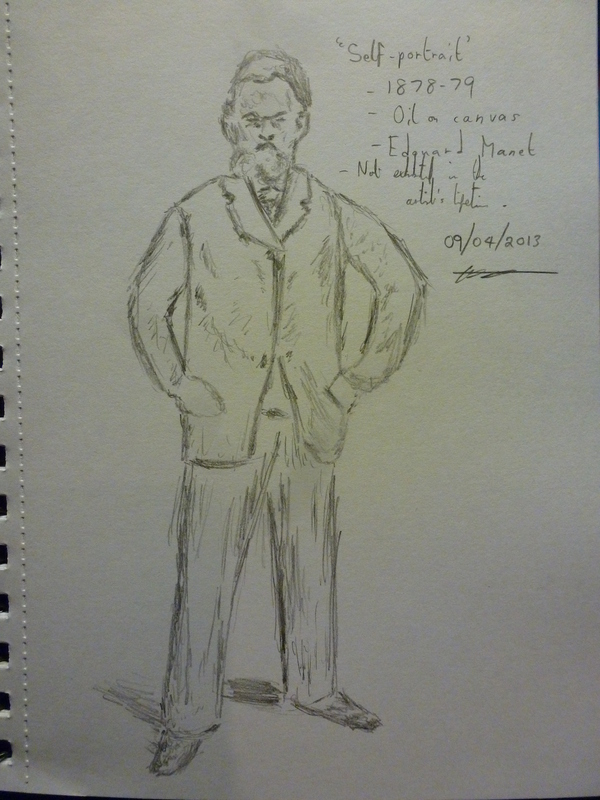 He actually refused to participate in any Impressionist exhibitions, despite being a keen supporter of their work. We learn of the supporters of his unconventional, yet effective, style of painting; as a man who gets along with the people he meets. In fact he met a few artists at the Musée du Louvre, notably Henri Fantin-Latour and Edgar Degas. 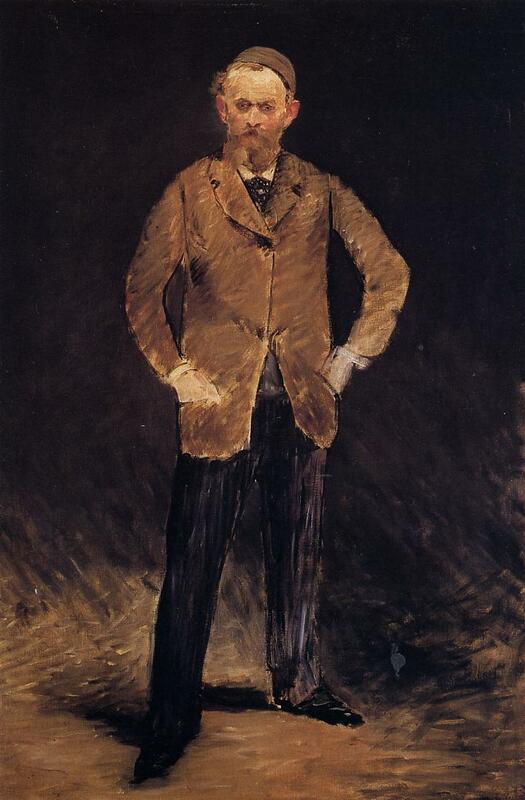 Édouard Manet, Self-portrait, 1878-79. Image via www.wikipaintings.org. “No photographs!” said an old man, referring to my drawing. Own photograph. The main thing I took away from the exhibition, however, was that Manet tried to portray his subjects in a modest manner. In his Portrait of Eva Gonzalès (c. 1879) he wanted to emphasise her beauty. Here I quote from the painting’s caption: “[the painting] functions more as a fashion plate, her looks suiting Manet’s penchant for depicting attractive women in pastel at the end of his career.” It is also interesting to note that this painting is much softer in its rendering than any of the other exhibited works. In Portrait of Lise Campineanu (1878) the artist depicts a little girl in an expensive blue dress, hinting at her social status. But her casual pose and innocent look reminds us that she is still just a child. Manet does a really good job of this, which makes him suitable as a Realist painter, regardless of his loose Impressionist style. Furthermore, his sitters are depicted as being exempt from their professions, such as in The Artist: Portrait of Marcellin Desboutin (1875) and even his Self-portrait (1878-79), one of only two independent self-portraits of the artist. Overall, the exhibition is well worth a visit and it’s not surprising that it was so popular and well received. If you’re in London in the next few days, check it out! PS. Be sure to look out for an etching in Gallery 7! 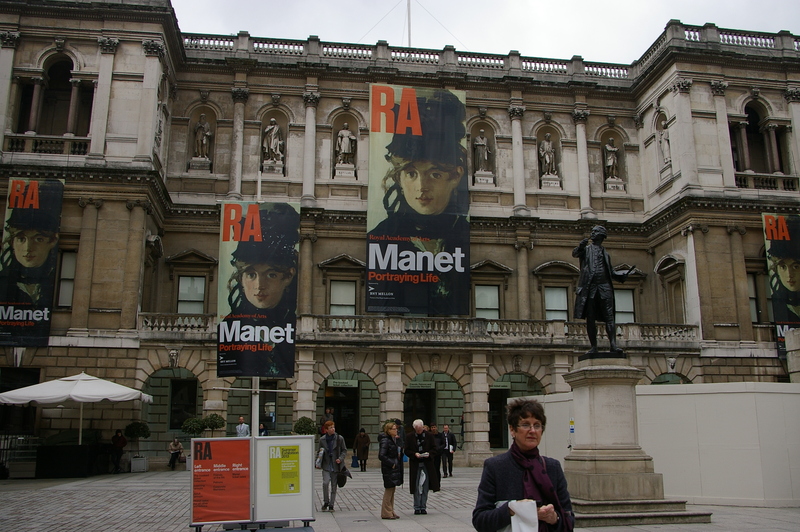 Manet: Portraying Life runs until 14th April 2013 at the Royal Academy of Arts, London, www.royalacademy.org.uk. Previous Post Easter break exhibitions! Next Post Don’t step into the light!